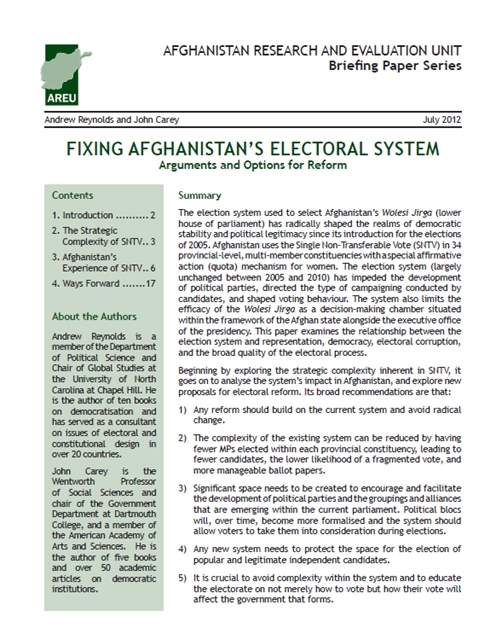 Following Afghanistan’s deeply flawed parliamentary election in 2010, calls for electoral reform among both national and international actors have been steadily gaining momentum. One major focus of criticism has been the country’s use of the single non-transferable vote (SNTV) system, which many argue must be scrapped or overhauled before the next set of legislative elections in 2015. 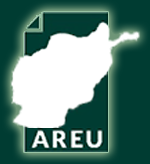 A new paper for AREU by international election experts Andrew Reynolds and John Carey explores how and why SNTV has been so damaging over the course of the last two rounds of legislative polls in 2005 and 2010. It argues that by choking political parties or other alliances of the oxygen they need to flourish, SNTV has left Afghanistan with a weak legislature, unable to advance coherent national policy programmes to deal with the country’s significant challenges. In addition, it highlights a raft of other problems that SNTV has either caused or exacerbated, exploring in particular the ways in which it has left the electorate struggling to see how their votes translate into meaningful representation. • Any reform should build on the current system and avoid radical change. • The complexity of the existing system can be reduced by having fewer MPs within each provincial constituency, leading to fewer candidates, a less fragmented vote, and more manageable ballots. • Significant space needs to be created to encourage the development of political parties, while at the same time ensuring that opportunities remain for independents. • It is crucial to avoid complexity within the system and to educate the electorate on not merely how to vote, but how their vote will affect the government that forms.